Conveniently set in Zevenaar, this charming hotel enjoys a privileged location right next to the entrance to A12 motorway connecting Hague with Lobith and 5.8 kilometres from Duiven train station. The establishment offers easy access to local businesses located in the nearby Arnhem, Duiven and Doetinchem as well as places of interest such as Hoge Veluwe National Park, Kröller-Müller Museum, Open Air Museum, local Zoo or a nearby theme park. The light-filled rooms offer a tasteful decor to create a peaceful and serene ambiance in which to recharge batteries at the end of the day. Guests may enjoy daily breakfast buffet and dine on delicious regional specialities in the on-site á la carte restaurant. Afterwards, they may relax with a drink in a lush hotel garden, while the youngest ones may romp for hours at the children playground. The hotel also features free parking.From the date of: 31/12/2017 CITY TAX OF 7% TO BE PAID DIRECTLY AT THE HOTEL. Property Location With a stay at Bastion Hotel Bussum Hilversum in Bussum, you'll be close to Dutch Fortress Museum and Spanish House. This eco-friendly hotel is within close proximity of Old Town Hall Naarden and Grote Kerk.Rooms Make yourself at home in one of the 64 air-conditioned rooms featuring refrigerators and LCD televisions. Rooms have private patios. Complimentary wireless Internet access is available to keep you connected. Conveniences include phones, as well as safes and desks.Rec, Spa, Premium Amenities Take in the views from a terrace and make use of amenities such as complimentary wireless Internet access and a television in the lobby.Dining Enjoy a satisfying meal at a restaurant serving guests of Bastion Hotel Bussum Hilversum. Quench your thirst with your favorite drink at a bar/lounge.Business, Other Amenities Featured amenities include a computer station, express check-in, and express check-out. Free self parking is available onsite. Property Location With a stay at Hotel Campanile Amsterdam Zuidoost in Amsterdam (Amsterdam Southeast), you'll be convenient to Academic Medical Centre and Heineken Music Hall. 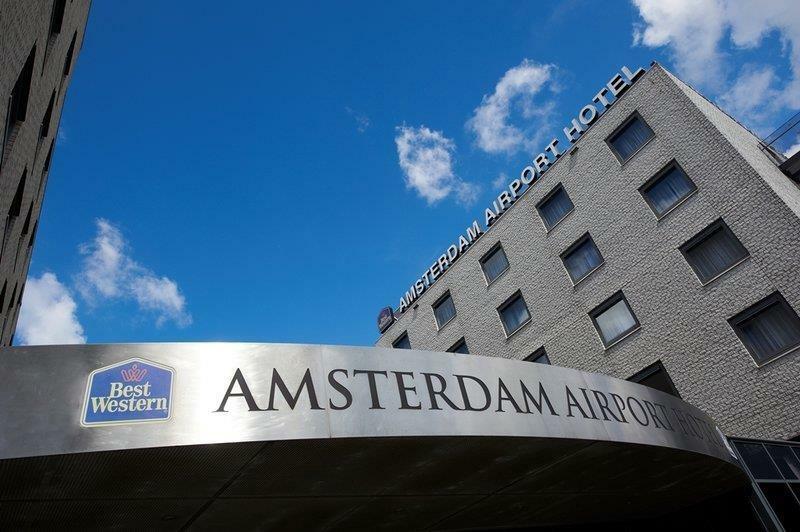 This hotel is within close proximity of Amsterdam ArenA and Ziggo Dome.Rooms Stay in one of 47 guestrooms featuring flat-screen televisions. Complimentary wireless Internet access is available to keep you connected. Conveniences include coffee/tea makers and blackout drapes/curtains, and housekeeping is provided daily.Rec, Spa, Premium Amenities Make use of convenient amenities such as complimentary wireless Internet access, a television in the lobby, and a picnic area.Dining Enjoy a satisfying meal at a restaurant serving guests of Hotel Campanile Amsterdam Zuidoost. Quench your thirst with your favorite drink at a bar/lounge. Breakfast is available for a fee.Business, Other Amenities Featured amenities include complimentary newspapers in the lobby, multilingual staff, and luggage storage. This hotel has 2 meeting rooms available for events. Free self parking is available onsite. 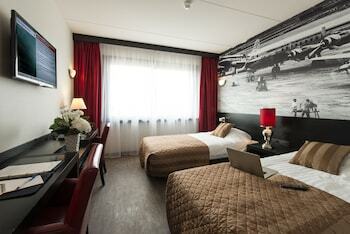 The Best Western Plus Amsterdam Airport Hotel is a 4 Star hotel that lives up to the Best Western standards. The hotel stands for personal atmosphere, hospitality, comfort and good facilities for an attractive price. The hotel offers 24-hour front office, comfortable hotel rooms and an à la carte restaurant. Guests are welcome in our cozy hotel bar and special smoking lounge. The smoking lounge provides a television screen with sports channels, air-conditioning and relaxing lounge chairs. Furthermore, the hotel offers free use of its fitness and swimming pool facilities available for all hotel guests, air-conditioning and free wireless Internet in the entire hotel. 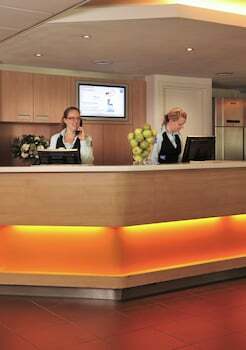 A computer is available at the lobby for hotel guests to use at no additional costs.The hotel is situated along the A4, across Schiphol Airport. By car, Schiphol Airport can be reached within seven minutes. Cities like Zaanstad, Haarlem and Leiden are well accessible. 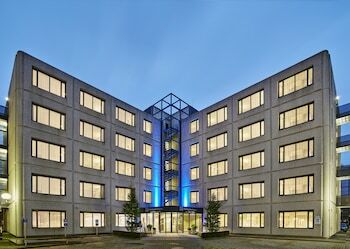 For the business traveler, the Best Western Plus Amsterdam Airport Hotel is ideally located near several business centers.The hotel offers 195 comfortable deluxe rooms and five quadruple rooms. The deluxe rooms are equipped with a television, modem, work desk, safe, free coffee and tea making facilities and a bathroom with shower and/or bath, toilet and hair dryer. 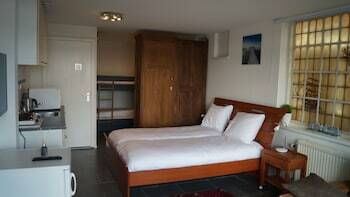 The quadruple rooms are more spacious and additionally offer a kitchenette and a sofa sleeper. Enjoy your stay. Property Location Located in Santpoort-Noord, Bastion Hotel Haarlem Velsen is close to Hans Brinker Statue and Nationaal Park Zuid-Kennemerland. This eco-friendly hotel is within close proximity of Corrie Ten Boomhuis and Grote Markt.Rooms Make yourself at home in one of the 87 air-conditioned rooms featuring refrigerators and LCD televisions. Complimentary wireless Internet access is available to keep you connected. Bathrooms have showers and complimentary toiletries. Conveniences include phones, as well as safes and desks.Rec, Spa, Premium Amenities Enjoy recreation amenities such as a fitness center or take in the view from a terrace. Additional features include complimentary wireless Internet access and a television in the lobby.Dining Enjoy a satisfying meal at a restaurant serving guests of Bastion Hotel Haarlem Velsen. Quench your thirst with your favorite drink at a bar/lounge. Breakfast is available for a fee.Business, Other Amenities Featured amenities include a computer station, express check-in, and express check-out. Free self parking is available onsite. Property Location With a stay at Best Western Zaan Inn, you'll be centrally located in Zaandam, convenient to Czar Peter House and Zaanse Schans. 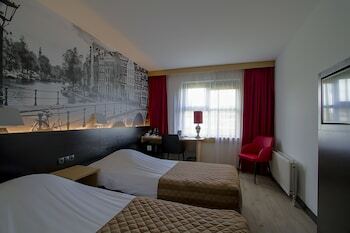 This hotel is within the vicinity of Zaans Museum and NDSM Werf.Rooms Make yourself at home in one of the 102 air-conditioned rooms featuring refrigerators and flat-screen televisions. Complimentary wireless Internet access keeps you connected, and satellite programming is available for your entertainment. Private bathrooms with showers feature complimentary toiletries and hair dryers. Conveniences include phones, as well as safes and desks.Rec, Spa, Premium Amenities Treat yourself with massages and facials. Additional amenities include complimentary wireless Internet access, gift shops/newsstands, and a television in the lobby.Dining Enjoy a satisfying meal at a restaurant serving guests of Best Western Zaan Inn. Quench your thirst with your favorite drink at a bar/lounge. Buffet breakfasts are available daily for a fee.Business, Other Amenities Featured amenities include limo/town car service, a computer station, and dry cleaning/laundry services. This hotel has 3 meeting rooms available for events. Free self parking is available onsite.